This image from the European Southern Observatory is of the Einstein Cross, a name given to a group of four high redshift quasars (Q2237+030 or QSO 2237+0305) framing the nucleus of the galaxy ZW 2237+030 (QSO 2237+0305 G) also known as Huchra’s Lens located in the constellation Pegasus. The redshift of the nucleus of this spiral galaxy has been measured at 0.0394 z which would place it at a supposed distance of a little over 500 million light-years from Earth using a so-called Hubble Constant value of 75 (km/s)/Mpc. The four quasars all display the same redshift of 1.695 z which would supposedly place them over 20 times further away at a distance of over 10.6 billion light-years. However a problem arises when closely examining the galactic nucleus and the four objects that surround it. I have taken a close-up image of the Einstein Cross from the ESO site and modified its color palette to produce a false color image as shown at the lower right. To product this image I simply opened the original in Adobe Photoshop, chose Image from the menu bar then Adjustments > Gradient Map… and set the color gradient to one of the preset options available. Changing the color gradient has not modified the pixel positions of the original photograph but has set their assigned colors to a smaller and more visible range according to their brightness. 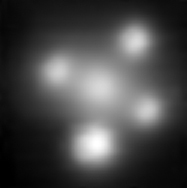 Though faint when viewed in the original grayscale image, in the new color palette connections between the quasars and galactic nucleus are clearly visible. In fact, despite their discordant redshifts, the streaming bridges of material between the objects and the nucleus are undeniable. Of course, this undeniable proof has not led the scientific community to reexamine their current interpretation of extragalactic redshifts or their adamant belief in the Big Bang Theory. Instead, the existence of the Einstein Cross has been attributed to, of all things, gravitational lensing. But this is a weak explanation at best. There is no valid scientific explanation given as to how a strong gravitational field would bend the light of a directly aligned background object into precisely four point objects. The majority of theories and models of gravitational lensing actually predict a ring effect as the result of the bending of light around a strong source of gravity. In fact there are several gravitational lensing simulations available on the Web that visually demonstrate this effect. However I have yet to find one that simulates the effect supposedly displayed in the Einstein Cross. Theories, models and simulations can indeed be helpful tools but nothing can match pure scientific observation. 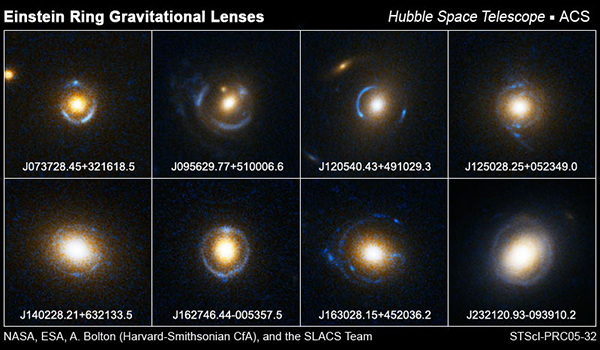 There are many examples of gravitational lenses that have been recorded by various observatories and almost all of them are in the shape of rings or arcs. The following image is a small collection of such “Einstein Rings” as observed by the Hubble Space Telescope and made available from the HubbleSite. It may seem extremely coincidental that four quasars with such exact matching redshifts have been observed in such close proximity to one another, particularly with several visibly connected to, and possibly even emerging from, the nucleus of a central galaxy. However this does not excuse the dismissal of the observations by attempting to apply a misappropriated and improvable theory to them. At the very least continued and improved observations of these objects, as well as all discordant redshift objects, need to be made. Only then will we finally move past the theories and hopefully embrace the facts. UPDATE: As suggested in the comment below by one of my readers, D R Lunsford, the positions of the objects in the Einstein Cross display tetrahedral symmetry. An excellent example of this symmetry are the four hydrogen atoms surrounding the carbon atom in a molecule of methane. 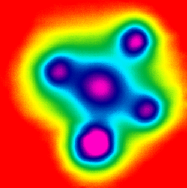 The image on the left is the molecular structure of methane generated by a Java applet and rotated to perfectly match the positions of the quasars and central core of the Einstein Cross as also suggested in this reader’s comment. For more information on tetrahedral symmetry as it applies to compact quadruple quasar systems please see my example PG1115+80. Thanks for the visual aid DRL and thanks again for reading!